This cruise ship arrived in port a day early due to a medical emergency just off the coast of Greenland. The weather was too harsh for the ship to pull into port, so she continued on to Newfoundland. The Astor is a regular visitor to St. John's, although this is her only planned stop in port this year. 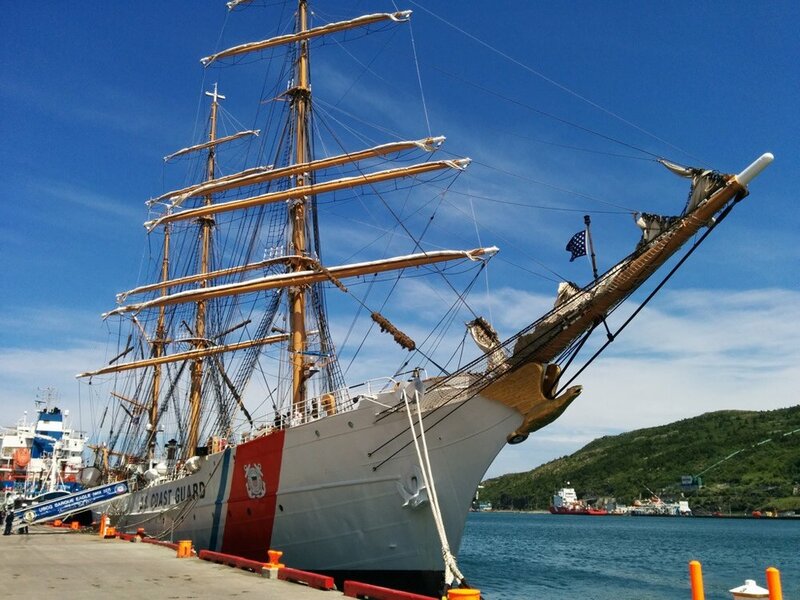 She is on a 37-day voyage from Greenland to Germany, with stops in St. John's, Sydney, Corner Brook, L'Anse aux Meadows, and some ports along the Quebec shore. As with many of the cruises that come in, this one can be spotted above the city skyline from the higher spots downtown. The large blue "T" on her smokestack stands for "TransOcean Tours", the tour company which charters her. On board she has many of the features that have become common on these toes of ships, such as a casino, sauna, indoor pool, conference spaces, and a showroom. I love when ships like her come into port, because they tend to brighten up the harbour. The downside to them visiting is Harbour Drive becomes even more jammed with cars at the end of the day because everyone pops down to take a look! I know this ship was in last week, but I wanted to include her in this week's list. This French vessel is co-owned by the oceanographic firm IFREMER (French Research Institute for Exploitation of the Sea), and the French Navy. She was launched in 2005, and has a capacity for 40 scientists and a 1000m2 science lab, as well as a crew compliment between 18-33. She specializes in geoscience, physical, chemical and biological oceanography, and carries on board the remote-operated vehicle (ROV) Victor 6000 and the manned sub Nautile. She has also been used to test the PERISCOPE, a recovery device created specifically for retrieving marine life from depths exceeding 2,000m. Before I move on, I just want to touch briefly on Nautile. Commissioned in 1984, Nautile can be operated at depths of up to 6km, and is one of the very few subs to have been used when diving the wreck of the RMS Titanic. She was also used by the Pourquoi Pas? to locate the airline voice recorder of AirFrance Flight 447. After the sub Alvin, Nautile is the one that I remember seeing the most on television when I was younger while watching shows about the Titanic and other deep sea missions. 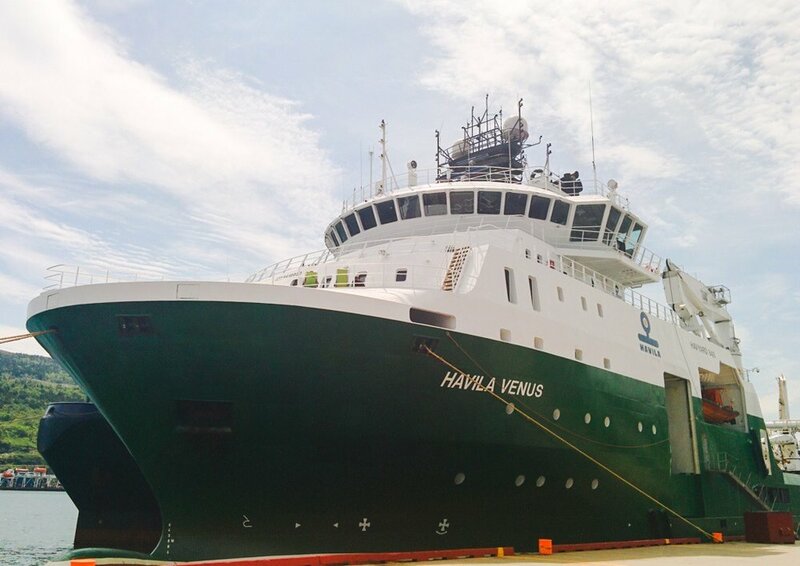 The Havila Venus is an anchor-handling tug supply vessel, run by Havila Shipping and launched in 2009. She is one of the largest vessels in this class, with a possibly compliment of 60 crew. These vessels are used to handle anchors for oil rigs, towing them out and anchoring them up. She also has the capacity to launch ROVs over her rail with her launch/recovery system. This gives the crew the ability to do sub-sea operations at a depth of 3000m. To see her in the harbour was really quite impressive. She had a gold eagle on her bow, clutching the Coast Guard crest in her talons, and a red Coast Guard stripe down the side. Even though she was tucked down towards the end of the harbour, she still brought a sort of elegance to the harbour. This ship was originally a German vessel which was given to the United States following the Second World War. Sailed from Germany in 1946, she has been used as a teaching vessel and tall ship by the American Coast Guard, sailing around the world for training every year. She has 9.7km of rigging and 2,070m2 of sail area. According to one if the crew members, she only goes under full sail when they are on open sea, or going into large ports like New York City. I was a bit disappointed, I was hoping for them to go under sail when they were leaving port. That's all for this week! Have a great weekend everyone!